Hopefully you have read part one of this series Dropped Stitches, Part One: Stockinette Stitch and understand the basic concept of picking up stitches. So let’s move on to Garter Stitch, shall we? It’s kind of ironic that the easiest stitch in knit is Garter Stitch, yet it is a little bit more difficult to figure out how to pick up your dropped stitches. The first step is the same when you find a dropped stitch in your garter stitch. DON’T PANIC! I can’t stress that enough. Go ahead…take a few deep breaths! That’s in… breath iiiinnnnnn annnnnnd ooouuuuttttt. In and out. The second thing you need to do is figure out from which side of the work you need to pick up your dropped stitch. If you look closely at the stitch, you will see it either has a v shape or a bump shape. In our case it has a v shape. For this example we will want to make sure the bar from the dropped stitch is in the front of the work. Insert a crochet hook (the same size as your knitting needle or smaller) from back to front and catch the bar that is in front of your work. To pick up the next bar, you can leave the hook in your work and pull up on the next stitch (which is now behind you work) just like you did with the stockinette stitch. Now you will want to start the whole process over again (including taking some deep breathes). So take your hook out of the work and position it from back to front and pull up on the bar in front of your work. Keep alternating front to back, until all of your stitches are picked up and you can put your ‘live’ stitch back on the left hand needle. Sometimes I get confused as to which way I should be picking up the stitches in garter. The good thing about this process is that if I do it backwards, I can just drop that same stitch down again and start over. Here is a video tutorial from Webs on how to pick up Garter stitch…in case this didn’t make sense to you. The most important part of this process is to not panic. If you are still having difficulties with this technique, most LYSs are willing to help you with quick fixes. Plus I am sure they are always happy to see your WIPs…dropped stitches and all! P.S. I know a few of you would ask about the yarn. This sample is in one of our most beloved yarns – SoftLinen in 2258 Turk Red. As some of you know, I used to work in a yarn shop. There are a lot of joys when you work in a yarn shop…seeing new yarns from reps, previewing lines before they are released, touching yarn ALL DAY LONG, talking with other people who love knitting/yarn as much as I do…the list goes on and on. But I think my favorite part of working in the store was helping people with their knitting and seeing them have their ‘ah-ha’ moment. The moment when whatever has been frustrating them (from new knitters learning to purl to experienced knitters finally making sense of that difficult cast on that has been eluding them) is what brought a smile to my face. Learning anything new as an adult can be a little overwhelming. We have much more fear and trepidation than we did as children, whether it’s learning to drive a car for the first time, playing a new sport or learning a new cast on. We know we can do it…yet there is something that is holding us back. My goal in today’s post is to encourage you to try something new in your knitting. And to NOT be intimidated by the process! One of the awesome things about knitting or crocheting is that no mistake is permanent. I know how devastating it can be to rip out (or frog* as we knitters like to call it) hours of hard work. On the other hand, I feel that having an FO that I am happy and proud of is worth the time and effort. When you go home tonight, I want you to pick up that project that has been hiding in the back of your closet, take a second look at that pattern that you have had your eye on (but seems a little advanced) or swatch a pattern that has a new technique in it. DON’T be afraid. You CAN do it! You may need to try it a few times, search the internet for some instructional videos or head off to your LYS for some help…but I have faith in you! And you should have faith in yourself! I think I have mentioned my love of cardigans before on this blog. You can wear them with jeans and sneakers for a casual feel or with a skirt and heels for the office. In fact…I am wearing cardigan right now. The Sea Anemone Jacket by Courtney Spainhower in the Summer 2014 Interweave Knits is no exception to my love of cardigans. In fact, I love it so much I am thinking of casting on and ignoring all my other WIPs. Knit in Soft Linen, this cardigan will be a year round staple in your wardrobe. I love the fact that it is an oversized cardigan, but doesn’t look frumpy or sloppy. And it has…wait for it…POCKETS! There is nothing I love more than a cardigan with pockets. I don’t know why. It’s not like I am the type of person who puts my hands in my pockets and I am cautious about putting anything heavy in my knitwear that has pockets (as to not stretch them down)…which means they normally are empty. But man…I love me a good pocket. I am really intrigued by the construction of this piece as well. You start at the lower back and knit up to the shoulder. You then work the each of the fronts separately, while leaving the stitches for the other front on a holder. After both fronts are worked you pick up and knit the ‘collar,’ which grows and becomes the pockets using short rows. I know that might sound a little complicated, but I think it is one of those things that once you start doing it and have your ‘ah-ha’ moment…it all falls into place. So don’t be intimidated if you don’t understand it right away. Because it is knit in one piece, there is very little sewing on this piece (something else I believe I have mentioned on this blog is how I love things that require little finishing). 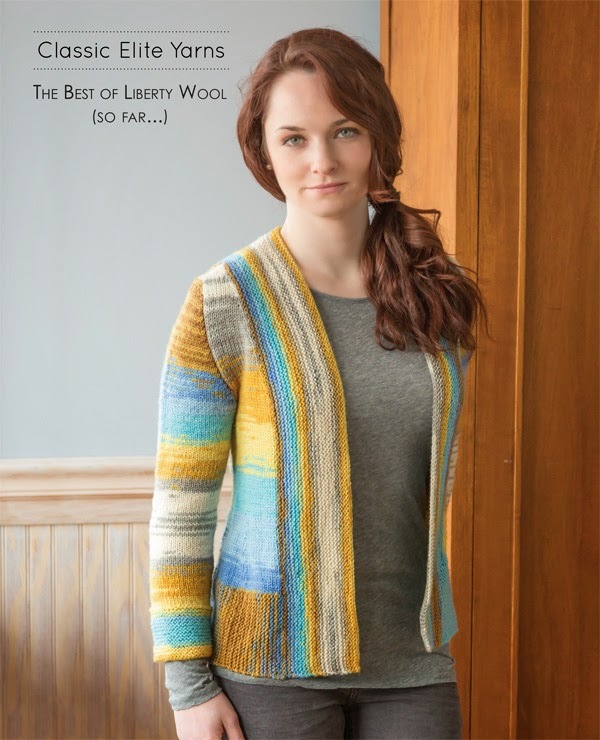 I must dash…off the warehouse to pick out my color of SoftLinen to make this cardigan! 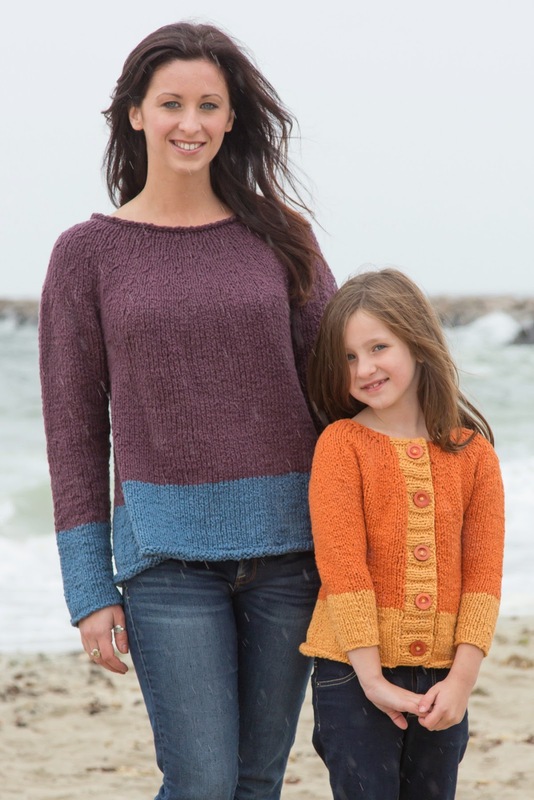 Photos courtesy of Interweave Knits. Joe Hancock, photographer. It happens to every knitter. And even as an advanced knitter, I still do it and I still cringe (and over react) when it happens. I am talking about dropping a stitch. It feels like the end of the world. But the truth is that it is really simple to fix. Today I am going to start a two part series on picking up dropped stitches. In this series I will be focusing on two of the basic stitches – stockinette stitch and garter stitch. To practice this, you are going to need a piece of knitting with a dropped stitch and a crochet hook in a similar size. If you don’t have the same size as your knitting needle, you will want to use a hook that is a little smaller. A bigger hook might stretch the stitch out and if you go too small it might difficult to catch the yarn with the hook. You want to catch the ‘live’ stitch with the hook from front to back with your crochet hook. With the hook facing up, catch the length of yarn from the backside of the work. Pull the length of yarn up through the loop on needle. Place new loop on the left hand needle. And violà, you are back on track! If you have dropped you stitch a few rows down, just keep repeating the process working from the bottom up until you have all the stitches picked up. Our friends at Web's did a short video on this technique. P.S. For those of you who are going to ask...my swatch is in Liberty Wool Solid in 7856 Hydrangea. Last week I told you about a few of the garments in our A Day At The Beach book and today I wanted to share the balance with you. All the sweaters in this blog post are made from one of our most popular yarns – Liberty Wool. Liberty Wool comes in both print and solid. After being beautiful and soft, the next best thing about Liberty Wool is that it is machine washable (as Cheryl can tell you about the Liberty Wool mitten she lost and then found in a melted snow pile). It is a hard working yarn that can makes stunning stockinette, lovely lace and charming cables. James is sized in both adult and child…so you can make one for every member of your family. Tonia Barry came up with a new twist on color blocking using 2 colors of Liberty Wool Print. 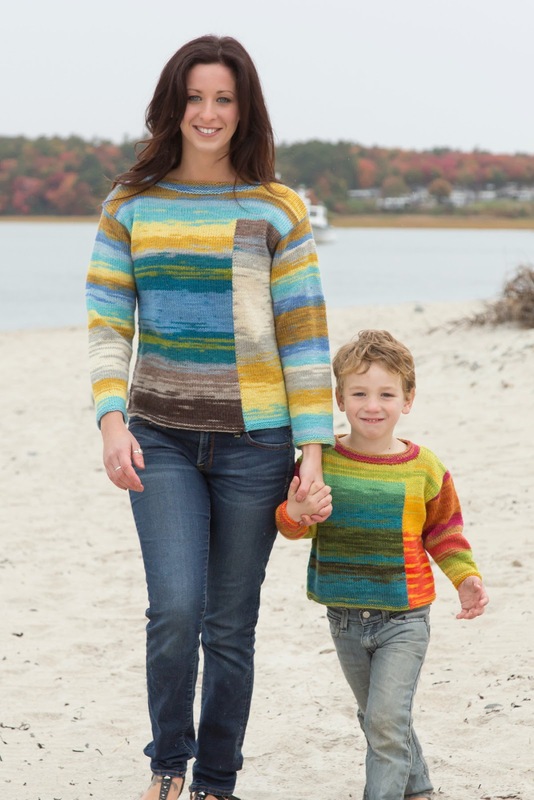 Using the intarsia method, the front and back of these sweaters are made of large panels of color. There are tons of different combinations on this sweater to make it uniquely yours. You could knit it using 2 different colors of Liberty Wool Print as shown, or chose one print and one solid, or maybe 2 solid colors. 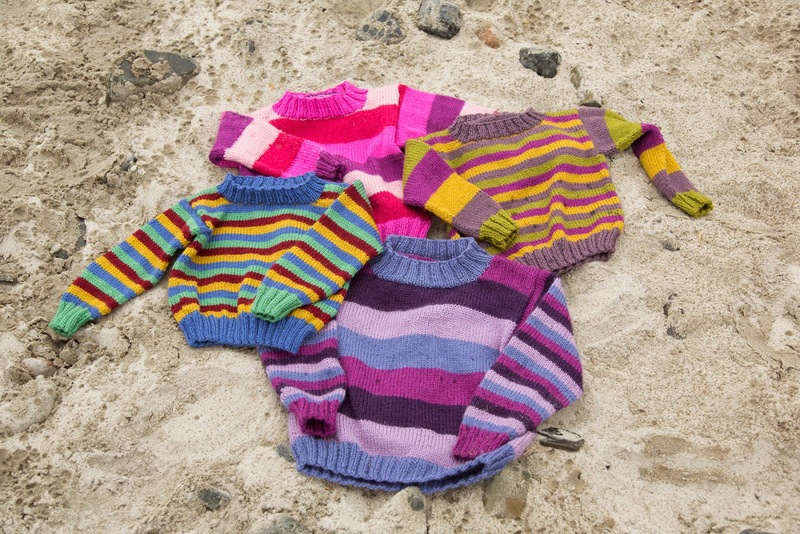 Another sweater with the possibilities of customization is the Stripey sweater by Susan Mills. I think this just might be the perfect child’s sweater - a classic style knit in a work horse yarn. I can see of being passed down from sibling to sibling and from cousin to cousin (and maybe even a few times around the neighborhood). Just like the James, Stripey has a ton of different possibilities! 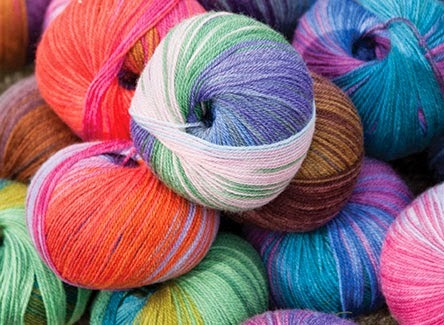 Liberty Wool comes in 36 solids…which alone makes for a ton of different combinations. But if you want to add in one of the 46 print color ways…well, I can’t even do that math! Yikes…Mother’s Day is this coming Sunday in the US. But don’t despair…it’s not too late to give the woman who helped shaped you into the person you are today a gift of fiber goodness! There are a couple of paths you can take. The first one is the obvious one…you can make her something. Now I know a bunch of you are already starting to sweat and think about the lack of sleep you will be getting this week. But I have given this advice before and I’ll say it again…think small. Remember when you were in the first grade and you made your mom a macaroni necklace and she told you how much she loved it? I am sure that she really did. Not so much because she had been dreaming of sporting macaroni necklace around town, but because you made it for her and you made it with love. The same is true here…but perhaps on a slightly more upscale level. Why not a nice spring hat? Or a bag that will make her the envy of the farmer’s market? Or a new hand towel for the guest bathroom? Our web letter patterns are chock full of great quick projects. My next suggestion is a spin-off of my first one. I have been known to do this on occasion…and I think it is perfectly acceptable. If you want to make your mother (or any other mother type figure in your life) a gift, but know it is not possible for you to finish the project in time, you can give her a picture of what the FO will be and a sampling of the yarn you are making it in. I have even wrapped a sock and a half and given it to the intended recipient and then asked for it back to finish it. The next suggestion is for those of you whose love of fiber comes from you mother. What does any knitter or crocheter dream of? More yarn of course! Maybe she has had her eye on some special yarn or project that she just couldn’t justify. Or she told you about a new project that she wanted to make, but hasn’t had the time to go out and get the supplies yet. Want to get her something fiber related, but not sure what? Many LYSs offer gift certificates. Ask yours (or hers) if they offer gift cards. Most will be willing to send it directly to your mother, if she lives in a different area of the country than you do. Whatever you decide to do for your mom (or grandma, our aunt, or any other special person)…don’t forget to call her on Sunday.